Please support keeping the Servolite website, documentation and hardware going by donating a little. 02/17/2012 - I noticed while cutting some 1" diameter pockets in 1/2" thick delrin that the pockets measure longer by about 4-5 mils in the x axis. I need to check for slop in the bearings as well as test for backlash in the x axis with a test indicator. I will also check the y axis too, but it has been more solid than the x. 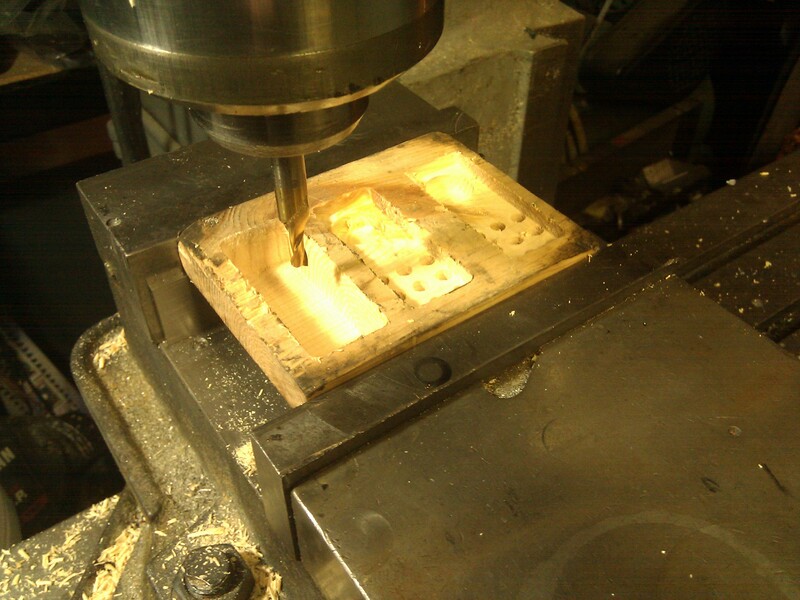 12/29/2011 - In trying to do some machining, the emi noise was causing the x axis and z axis to be unstable. I routed the cables apart from each other with cardboard spacers. That helped the Z axis. The x axis was losing accuracy still. I looked inside of the chassis, and noticed that all of the pwm wires were all bundled together from when I first assembled this system. So I separated the pwm wires. This worked incredibly well!! Today I got the cnc up to it's max of 135ipm!! That's as fast as the 800mhz pc can produce! The system has now been very stable and repeatable. I even raised the voltage from 80vdc to 90vdc to the motors. Now the holding power is even better. I've adjusted the amps a little too. But rerouting the internal pwm wires and external pwm cables did the most good!! I'll start cutting material at high speed to check the accuracy under load. So far the testing is just cutting air. A couple weeks ago I took the y axis dro scale out and cleaned it. It was almost not working at all. It still shuts off at the extreme ends of the y axis travel. But it has been stable for any machining I've needed to do so far. This evening I machined pockets and drilled hole patterns at 135ipm in wood. The system was perfectly accurate!! Here is a video of the cnc cutting the rectangular pocket code in the air, at up to 135ipm. It plays with Quicktime. 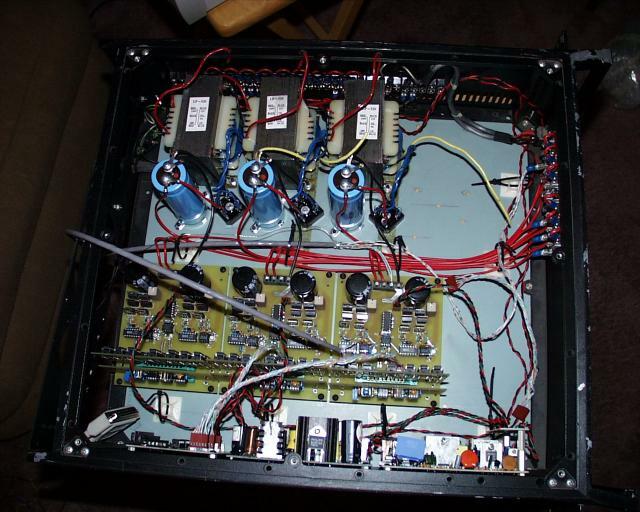 03/14/2010 - The recreated Servo Lite website has been updated with 200 volt Amplifier parts! It allows up to 125ipm feed rates with my 800 hz pc! Works great on Mach3. 03/12/2010 - The Servolite boards have been repaired! They were also upgraded with 200 volt amplifier parts. 125ipm can now be reached!! But there was still a lot of noise on the Z axis as the motor would oscillate severely. I used my oscilliscope to look at the encoder cable signals. There was significant (16-18v spikes) on the encoder wires. I added torroids to the motor power supplies and .022uf caps across the large filter caps for each axis. The encoder signals were still noisy with 16-18v spikes. Noise was reduced to about 3-5v by grounding the shields of the encoder cables to the 5 volt ground power supply terminal. This helped a great deal!! 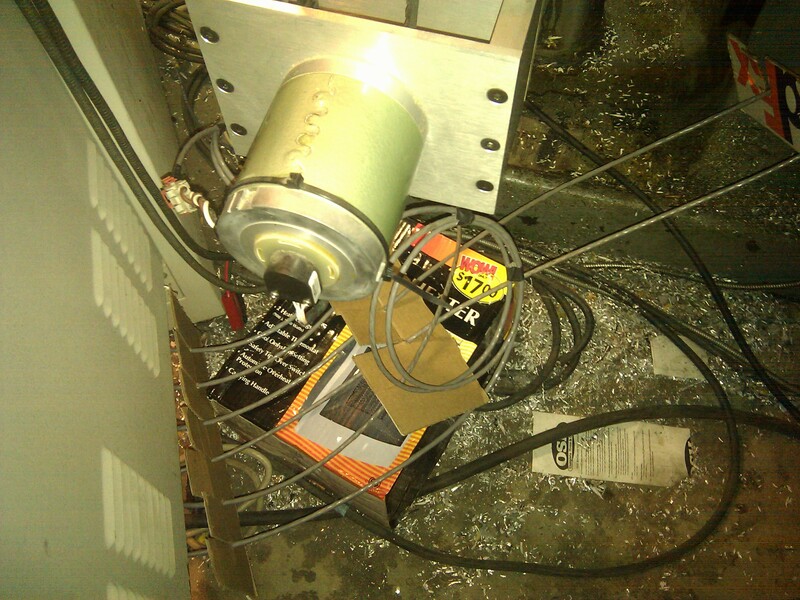 03/6/2010 - Went to use the cnc system for looking at winding a 3000 turn coil with it. As soon as I turned it on the fets and diodes popped on the Servolite boards. The large variac knob had been rotated from 55vac output to 130vac output when I installed a new power supply in the rack mount cabinet. All 3 axis of Servolite boards have to be repaired. 01/24/2007 - Purchased Mach3 for running my cnc. Also purchased the Newfangled addons from Newfangled Solutions. 01/16/2005 - Here is a great site that has many links to every kind of CNC software you could want. 01/10/2005 - The old Servo Lite website has been recreated here. 02/12/2002 - The play in the Y axis seemed to be related to a lack of oil on the ways. Tightening up of the gibs, did not change much. But after a good oiling, the play is now about .002". The mill only has grease zerks. So the new grease gun is now used to dispense oil. It keeps the ways very well oiled now. The new bearings did not change anything. 01/18/2002 - There is a mysterious .003" of play in the cross axis (Y axis). It can been seen when a circle is machined. It appears that the bearings may be the culprit. New bearings have been ordered. 12/14/2001 - The EMI noise interfering with the CNC electronics was reduced by installing a ferrite bead filter, from KB Electronics, on the output of the VFD. It really made a difference. I removed and replaced the filter 3 times. The results were very repeatable. 11/03/2001 - Mounted the 14000 mfd-75 vdc caps and bridge rectifiers on a panel that was installed into the rackmount cabinet. The voltage to the servo motors is now 75vdc up from about 28 vdc. What a difference in cutting speed!! The motors have way more torque also. The motors and the electronics still stay nice and cool. The higher voltage did create more noise that interferes a bit with the motors. The noise is still being debugged. 10/03/2001 - I found some capacitors that will help upgrade the motor voltage to 75 volts. A mounting plate needs to be made, then testing will follow. The long axis will be getting a new motor mount that moves the motor to the backside of the table. 07/21/2001 - New Ball screws were added to the table a couple months ago. They are smooth and have a little less drag than the ACME screws. This should help the motors cut faster. The CNC retrofit has been great. It cuts aluminum smoothly and reliably. I even cut some painted aluminum chassis panels for a project at work. For faster cutting the motors need a higher voltage power supply. Experimentation with voltages up to 70VDC give the motors more torque. The motors are running at about 30 VDC right now. The motors are rated at 38VDC. Choosing CNC Pro for the software proved to be a good decision. There are other great software packages out there, but this one works great on my slow 75mhz pentium box. The Look Ahead and Constant Contouring features in CNC Pro are so sweet!! The mill can cut perfect circles all day!! All for $200. The Z axis has .020" of backlash. Even though the software can compensate for this, it's just more than I would like the machine to have for real 3D machining. Currently I'm limited to 2.5D. 03/30/2001 - The Servo Lite CNC electronics are now up and running. There was some kind of a ground/noise problem. Every time I turned on the mill, the servo motors would go crazy and start rotating out of control. By disconnecting the shield of the motor cables at the amplifier end, the problem disappeared. Currently the mill still has the ACME screws and nuts in the table. I'll do some checking on the repeatability of the machining. So far initial testing without cutting any material, is showing error to be less than .001". I think the best test may be to see how well it machines a circle. The design for the Z axis hardware can now also be started. I have a rotary table that just needs a motor and an amp to complete the 4th axis. This would make it very easy to port helicopter motors. Heat sinks will need to be added for more reliability of the amps. More pictures are coming. 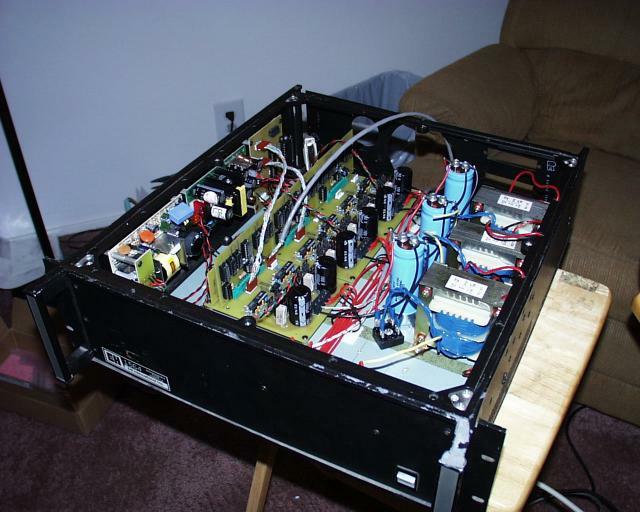 03/01/2001 - A chassis designed for a rack mount cabinet was gutted to hold all of the Servo Lite CNC electronics. The electronics were successfully powered up. The only problem came from stray chips of metal across the power switch that resulted in some fireworks and smoke on power up. Got to check those salvaged chassis more carefully. Each axis works fine otherwise on the living room floor. The software does not match the axis selected, so there is a bit of debugging ahead. Some heat sinks need to be added to the fets for a longer life. The remaining parts shortage was filled from a local source. 01/29/2001 - The CNC kit is almost completely assembled. The electronics were short just a few resistors. I let Bill know, and he will send the shortages with the motors and encoders. I picked up a new 19 inch rack mount cabinet that's four feet tall. It should protect the computer and all of the hardware from stray chips. The cables still needs to be figured out, and the shelving for the cabinet has yet to be designed. 01/15/2001 - The Bridgeport table is now re-assembled. Just ordered the Servo Lite CNC kit from Bill Wainwright. A chassis still needs to be selected. There will be other expenses like the motor mounting brackets, and possible pulleys and belts if a mechanical reduction is neccessary. Ballscrews are around $900 if they are required. 12/09/2000 - The head of the Bridgeport was completed last night. Today I connected the VFD (Variable Frequency Drive), and test ran the motor. The VFD works great. The VFD converts single phase 120 VAC to 240 three phase and it has variable speed and reversing too. The entire head and pulley assembly run very smooth and quiet!! The next step is to rebuild the table. 11/28/2000 - All of the bearings have been replaced. Ordered parts from JR's in Texas. These will allow the completion of the mill. 11/10/2000 - Just purchased a Bridgeport vertical mill!! It has a seized spindle. Disassembly is well under way. With help from the rec.crafts.metalworking newsgroup, I will finish disassembly and order the neccessary parts. Here are pictures from Marty's site that shows a Bridgeport going through a complete restoration. Here is a Bridgeport serial number chart to identify what year it was made. 8/29/2000 - I now have working 1 gig drive and a fresh Windows 98 SE2 system installed in my old 75 mhz pentium box. This will work great for the brains of a CNC setup. I was also given a 300 mhz 5500 desktop Mac that seems to work ok. So I can drive the CNC from either platform. Mr. Bill's a site that uses open loop servo electronics for better accuracy and economy. He uses standard DC motors instead of stepper motors.